Whether you're looking to go cash-only or simply wish to rein in your spending, the envelope system is a great budgeting tool. Learn how to put it to work for you. Setting up an envelope budgeting system is easy and takes about an hour. You can either put actual cash into each envelope or specify an amount and then keep a tally on an envelope of what's allotted for that category and what you spend with a debit card. Getting started is easy. All you'll need is envelopes, a pen or pencil, and a copy of your budget. Review your budget: For the envelope system to work, the first thing you need to know is how much money you have coming in and how much you have going out. Start by making sure your budget reflects your current financial situation. If you don't already have a budget, establish one. Separate your expenses: Expenses like a mortgage payment or rent, utilities, and insurance are difficult or impossible to pay with cash and also virtually the same every month. These should not be part of your envelope budget. Subtract these expenses from your total monthly income and then divide the remaining cash among the envelopes. Divide your spending into categories: Look over your budget and divide it into areas of spending you can cover with cash or a debit card: food, gasoline, clothing, and entertainment are the big four, but include all that apply to you. Then, create an envelope for each category. There is no need to be fancy; a plain, white envelope with the category written on the front will do. Fill your envelopes: Fill each envelope with the money you've allotted to that particular category or indicate on the envelope the amount you want to spend via your debit card in that category. 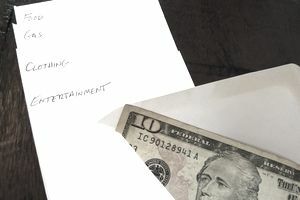 Spend until the money is gone: Pay for your purchases out of the appropriate envelopes—but only until the money is gone. If you're using a debit card, subtract each expense on the envelope until you reach zero. At that point, all spending in the drained category must cease until the next month. Put any leftover money into savings: If you have money left in your envelopes at the end of the month, add it to your savings or use it to pay down a debt. Another advisable method is to create an envelope strictly for savings. When reviewing your budget, determine how much money you can set aside to not be spent. Refill again the next month: Refill or mark the envelopes and start again. Each month is a new opportunity to make your budget work. When getting started, it's likely you'll hit some snags or the reality of unexpected expenses will get in the way of your plans. Don't worry. The first few months are a good time to revise your envelope plan to reflect your actual spending habits and to account for expenses you perhaps did not consider when you started. Tweak your category allocations over the first few months until you arrive at numbers that work for you. If a monthly envelope system doesn't work for you, try a weekly or bi-weekly envelope system, depending on how frequently you receive a paycheck. The goal is to create a system that keeps your spending under control.